The last couple of years wreaked havoc on my body. In November 2013, just a few short months after I started getting a handle on my health, I got pregnant with twins. My body conceived, carried, gave birth to, and nourished through 12 months of breastfeeding my precious Titus and Evangeline. Dedicating my body to such a task has been a great joy, and also a great sacrifice. The babies are now toddlers, and the responsibilities for my body have changed. Instead of rest, extra calories, and snuggle time, I now need to have greater strength, endurance, speed, and alertness. It’s time to restore my health and fitness. It’s time to rejuvenate with purpose! Since I can’t seem to stick with my goals unless I give them them titles and nicknames, I have created Becky’s Better Body Plan. The plan is to have a body that feels better, looks better, and functions better for the season God has for me to live. I am not going on a diet, nor am I criticizing the body I have. I actually like it. In fact, my husband loves it, my kids lived in it, and I have a decent time getting around with it. This Better Body Plan is not a response to some kind of internal hatred towards myself. Rather, because I love and am grateful for the body and life God has given me, I feel privileged to pursue greater health, strength, and perseverance. Below are the specifics for my plan to rejuvenate my body for God’s purposes. Eat something fresh (fruit or veggie) at each meal. When you eat rich or indulgent foods, ENJOY them! My child, never forget the things I have taught you. Store my commands in your heart. For many of us, having a healthy body is as simple as having a healthy relationship with God. Prioritizing His Word provides perspective on food, work, laziness, excess, and general health. We are able to enjoy a satisfying life in Christ when we hide His commands in our heart. 4. I am also giving my body a system cleanse (similar to a juice cleanse), which will provide a good foundation for my digestive health, and hopefully resolve my dairy issues (a complicated relationship since last October). Its important for us to remember that rejuvenation is not just to increase our energy, feel younger, or freshen up our appearance. Even though I am finished physically nourishing my children, my body is still not just about me. 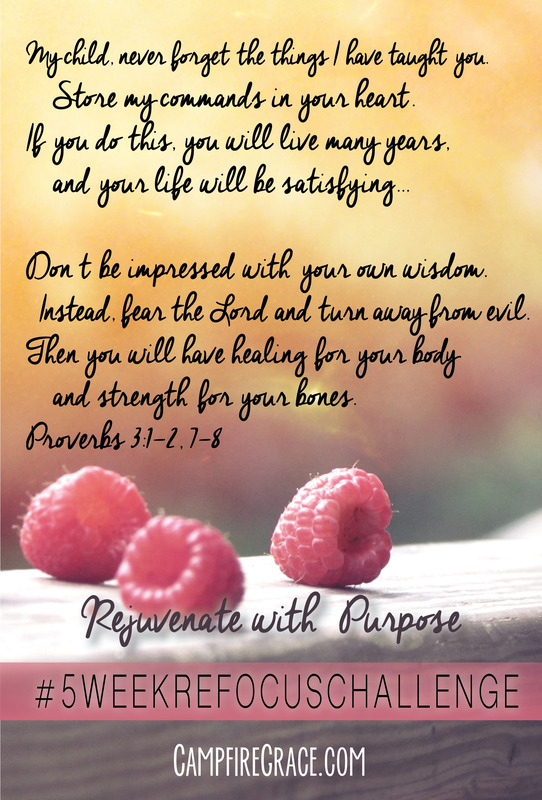 Rejuvenating with purpose means we are agreeing with God’s prerogatives for our lives, and championing healthy bodies to meet those purposes. Give us grace to use our bodies for your purposes. Keep us healthy to do so to the best of our abilities. If health is not possible, give us strength to serve you in through the struggle. Thursday (through the weekend): Spend some time enjoy your favorite life-giver with a friend, your family, or just by yourself (is that a novel idea for you?). Friday: Make a Better Body Plan with your name on it. Strategize how you can keep up this plan through the rest of this season/semester. Saturday: Kick start your rejuvenation with something special for your body. 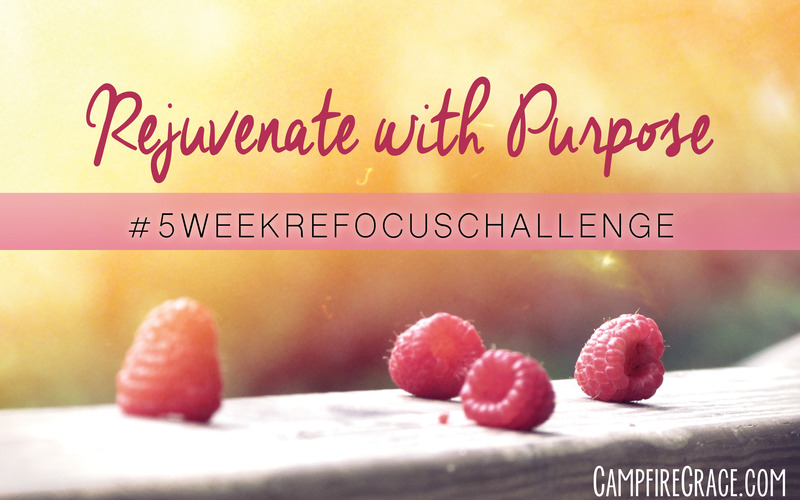 Share your “treat” with #rejuvenatewithpurpose and #5weekrefocuschallenge on instagram! What do you need most in your season to rejuvenate for God’s purposes? Becky we must totally be on the same page lately! I’ve also decided I need to be intentional about how I’m treating my body and taking care of it. Especially entering into marriage (where they’ve proven you tend to adopt the health habits of your partner!) I want to be the best person I can be, and that means getting into solid habits of taking care of my body. I’m working on hitting the gym more often and filling my body with good stuff. Totally going to make myself a face mask and do a mini spa-sesh to kick off my weekend! Awesome post! Thanks! I love the affirmation!